Total settlements in the multidistrict litigation top $1.2 billion. 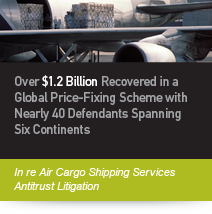 In November 2006, Labaton Sucharow filed a class action lawsuit on behalf of plaintiffs who purchased airfreight shipping services directly from major domestic and international air cargo carriers. The plaintiffs alleged that the defendants participated in a global conspiracy to unlawfully inflate the prices charged to ship goods by air transportation between January 1, 2000, and the present. Additionally, 21 defendants have pled guilty to their role in the conspiracy and one defendant was accepted into the Department of Justice's Amnesty Program. On August 21, 2009, the court upheld the plaintiffs' direct purchaser claims under the Sherman Act. In addition, over 20 airlines have been identified as conspiracy participants in the European Union, and numerous airlines have been prosecuted for their unlawful conduct in other areas of the world, including Canada, Korea, Japan, Australia, and New Zealand. On August 31, 2015, the court denied the remaining four defendants’ summary judgment motions—the last attempt for the remaining defendants (Air New Zealand, Air India, Polar, and Air China) to get out of the litigation—and granted all of the plaintiffs’ motions. On May 9, 2016, the plaintiffs announced they had reached deals with the last two defendants in the case—a $35 million deal with Air New Zealand and an undisclosed amount with Air India—bringing the total to more than $1.2 billion in settlements.